Installed at The IFH Group West, the machines are expanding the capabilities for fast, repeatable cost-effective printing and reducing lead times. The IFH Group West has improved the quality of its printing, cut its costs and improved lead times with the DCS® Direct Jet UV LED Inkjet printer. 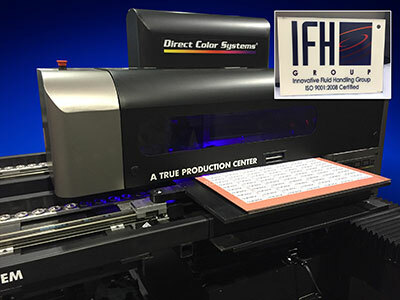 Arlington, WA, August 23, 2016 – The IFH Group West has enhanced production capabilities by replacing its silk screening and adhesive labeling processes with a Direct Jet Flatbed UV LED Printer from Direct Color Systems®, Rocky Hill, CT. The IFH Group West will use the new system to imprint part numbers, specifications, logos and other information on things like audio chassis, kiosk vending machines, cabinets, lasers and other enclosures. The IFH Group West, LLC (Arlington, WA) fabricates an array of custom electrical enclosures and precision sheet metal parts. The IFH Group West is a subsidiary of The IFH Group (Rock Falls, IL), the originator of industrial fluid storage and handling systems and a leading fabricator of custom hydraulic reservoirs and fuel tanks. Like all of The IFH Group West’s enclosures, the DCS flatbed inkjet printers are made in the USA. They print high-quality full color images directly onto a variety of flat and 3-dimensional substrates, ensuring high repeatability. The IFH Group West routinely applies images and designs to aluminum 5052-H32, cold rolled steel, or 300 Series stainless steel substrates that have been painted, powder-coated, black-anodized, or finished with a chemical conversion coat. Unlike silk screening, everything is done in a single pass and the part is UV-cured in the machine, eliminating curing time afterward. Why should I spend money on a lube cart when I have drums to store my fluids? Why use aluminized steel for your hydraulic reservoirs? What makes a world-class lube room world-class?